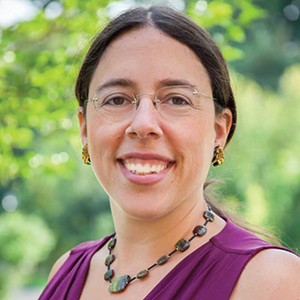 Leslie New was studying natural resources as an undergraduate at Cornell University when she had a eureka moment in an applied statistics class. She loved numbers, and her field of interest, particularly wildlife management, needed numbers people. She could combine her interests, she figured, into an in-demand specialty. As a science, wildlife conservation needs data to help develop practices and measure their effectiveness; and it needs statistical experts to collect and interpret the data. New’s ambitions took her to Scotland, where she earned her doctorate in biology and statistics at the University of St. Andrews and worked on marine mammals before returning to the United States. Now an assistant professor of statistics at WSU Vancouver, her current studies include impacts of human activities on marine mammals and birds. In recent research with colleagues at the U.S. Geological Survey (USGS) and U.S. Fish and Wildlife Service, she helped develop an innovative approach for predicting numbers of bird deaths from wind turbines before the turbines are built. The new statistical model incorporates the element of uncertainty, which has been missing in other models. “Bird fatalities due to collisions with rotating turbine blades are a leading concern for wildlife and wind facility managers,” according to a USGS study statement. The model New helped develop builds on previous approaches by directly acknowledging uncertainty inherent in predicting bird deaths. And the computer code she and her colleagues provide will enable other researchers and turbine operators to readily apply the model to their own data. “Management decisions regarding the effects of human activities on wildlife ideally should be taken long before someone notices the species in question is in decline,” New said. 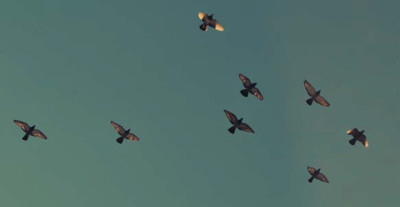 Bird deaths can never be predicted exactly because of all the contributing variables, including heights of structures, project size, changing bird populations, and topographic features such as ridges and rivers. But the model New and her team designed can be adapted to take these factors into consideration. While the model can be applied to various species, New based her case study on the golden eagle, a protected bird that is especially susceptible to wind turbine collisions. Although harming or killing golden eagles is a prosecutable offense, developers of wind projects can obtain permits in advance, which requires a mitigation plan to avoid risk of prosecution. “When you apply for a permit, you have to predict the number of eagle fatalities, state how you will offset any eagle taken, and have a post-construction monitoring plan,” New said. By incorporating uncertainty into their model, New and her coauthors enabled the U.S. Fish and Wildlife Service to better assess the threat to eagles, and they provided developers with a more reliable way to estimate their risks. As data are collected after the turbines are built, the model will be updated. It’s an example of a learning process called adaptive management, New said. Another of New’s recent projects centered on a well-known school of bottlenose dolphins in the Moray Firth of northeast Scotland. While tourists from around the world flock to the inlet to watch the sleek aquatic mammals at play, the firth’s waters also draw industrial speculators interested in developing the area’s vast potential for traditional and renewable energy. 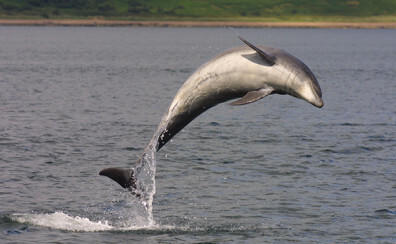 To help meet the needs of both industrial and wildlife conservation interests, New and her collaborators at St. Andrews and the University of Aberdeen in Scotland developed a mathematical model to assess how increased boat traffic, construction, and dredging from development of offshore installations would affect the dolphins’ feeding habits and care of their young. When it comes to long-lived marine mammals, it is hard to predict the long-term consequences of construction projects and other human activities because they don’t necessarily kill or injure exposed animals outright, New said. They may instead cause subtle disturbances to the dolphins’ behavior or activity patterns which can lead to population decline later on. She and her collaborators created a virtual model of dolphin habitat in the Moray Firth using previous studies on dolphin ranging and foraging patterns. They overlaid the model with data on boat traffic and potential construction activities for three proposed development projects in the area. As simulated female dolphins traveled through the environment, their movement and foraging behavior corresponded to the activities of monitored real-world dolphins over the course of six summers (2006-2011). Multiple simulations were run for each of three disturbance scenarios to gauge how well the dolphins responded to approximated levels of human development. In the first scenario, the simulated dolphins had plenty of food and environmental conditions were ideal. In the second scenario, food and environmental conditions were average, and in the third, both were trending towards poor. The model predicted no substantial changes to the dolphin population during the construction phase of each project. However, during the simulated operational phase of the offshore installations, a relatively small increase in the number of boat interactions made the dolphins in the third scenario slightly less likely to forage and consequently to feed their calves. “Our work could help guide management decisions, accelerate the consenting process for coastal and offshore developments, and aid in the design of targeted monitoring programs for dolphins and other marine animals around the world,” New said. The flexible framework of her research approach makes it possible to design models to predict the long-term consequences of construction and other human activities on populations of different types of birds and aquatic animals, such as orca whales in the Puget Sound. Her modeling work already is helping scientists determine the impacts of human activity on whale populations in the North Atlantic. And, on the other side of the globe, New is working with Australian researchers to use a similar model to gauge the impact of disturbances on the long-term health of southern elephant seals.